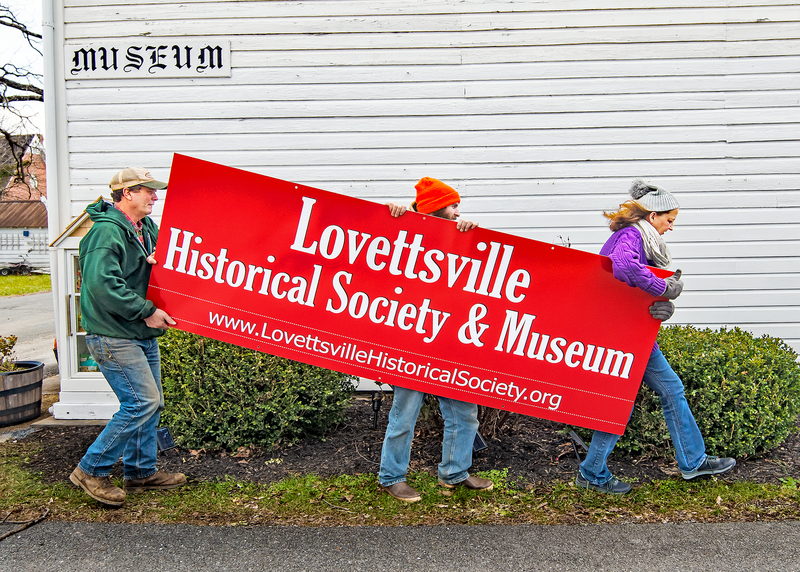 The Lovettsville Museum’s new scarlet red sign was hung on the west side of the museum that is located in the parking lot of the Lovettsville Town Hall. The sign is 8 feet long and 3 feet wide and runs nearly one third of the 25 foot length of the west side of the museum building that faces the Town Square. 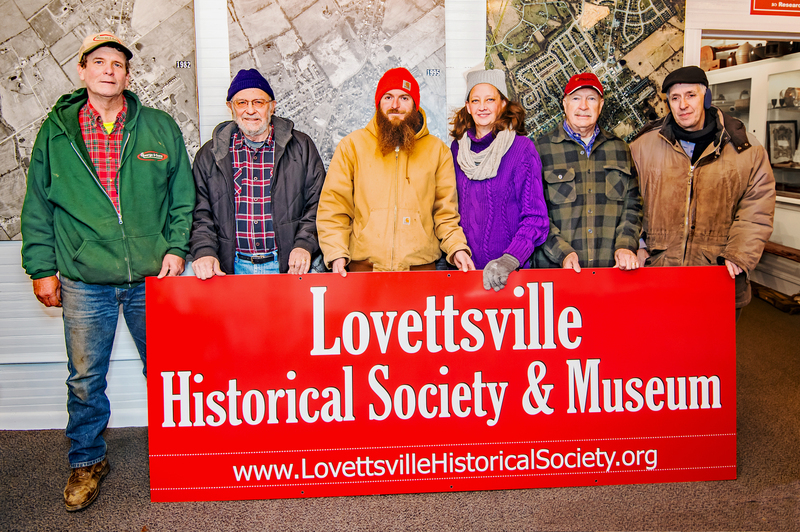 The design on the sign was created by Lovettsville Historical Society Board Member Melani Carty and is now the museum’s new logo. 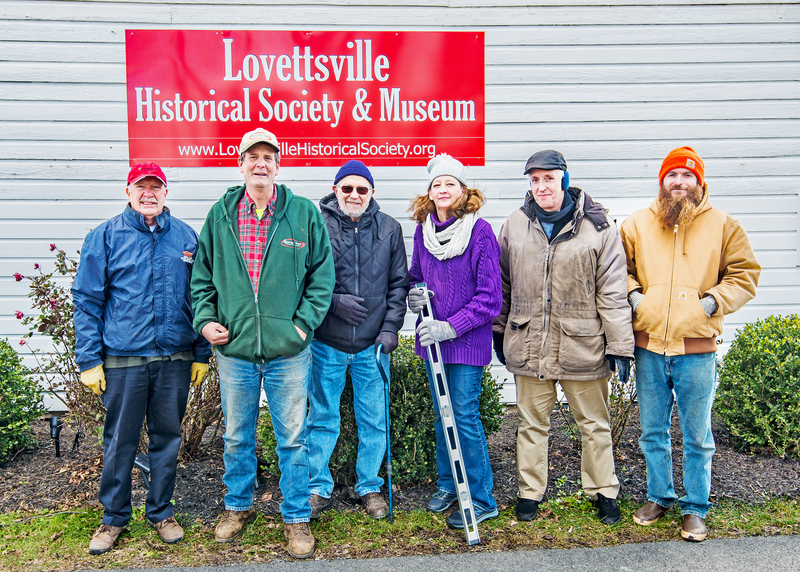 The new sign was hung on Wednesday, November 28 with the assistance of the Lovettsville Historical Society Board members. 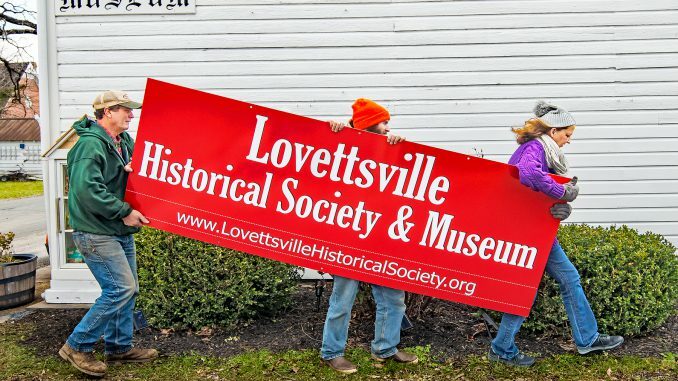 The Lovettsville Museum is solely dedicated to telling the story of the community in which it is located noted the Lovettsville Historical Museum in a recent press release. Over the last year and a half, the Lovettsville Museum has undergone major renovations to its interior that now provides better lighting and display areas for visitors to view the museum’s local historic pieces and artifacts, new interpretive posters, hands-on interactive display for kids, and increased area for researchers to more easily access the files in the archives room. Additional display boards with aerial photographs of the area from 1968 to 2018, with 1982 and 1995 in between, showing how much the town has grown, are now on display inside the museum. A large wall display, written by LHS vice president Ed Spannaus, is dedicated to telling the story of the German migration from the German Palatinate, across the Atlantic to New York, Pennsylvania, and Maryland into Virginia. Carty, along with Lovettsville Historical Society Board member Mike Zapf, were instrumental in the renovation of the museum. Both have been members of the Lovettsville community since the early 2000s. “We have been able to brighten and lighten the interior. And recently we have added more descriptive displays and posters where we can integrate photos from our historical archives. The interior is now more spacious and more organized,” said Carty and notes the museum’s next order of business will be to place the displays in chronological order. She also mentioned their museum gift shop’s product offerings will be expanded in the coming months. “We have the resources but didn’t have the museum set up properly to tell the story,” said Zapf so they set out to reconfigure the entire interior of the museum to give everyone an idea of what Lovettsville is like and how it changed over the years. “We are trying to transform the museum from a place that just has objects in it to something that tells a story,” said Zapf. “We have comprehensive archives that people from across the country come to us to ask us about their ancestry. Some come to visit in person and members of the Lovettsville Historical Society are able to take the visitors to the original homestead. They really make a connection,” he continued. While the Town of Lovettsville owns the building in which the museum is housed, the Lovettsville Historical Society maintains the inside with its historical pieces and artifacts and staffs the museum with volunteers when it is open on Saturday afternoons. In coordination with renovations, the Lovettsville Historical Society is just beginning the process of expanding their website by digitizing their archives and records, thanks to a generous grant in 2018 from the Loudoun Preservation Society for a high quality large format scanner. “A great way to expand the reach of the museum is to put more items online with the intent of eventually placing all of our archives online,” said Carty. “People from Lovettsville starting from the 1830’s were migrating to the western frontier, places like present-day Ohio, Illinois and Indiana, in search of less expensive farm land. We get a lot of calls and emails from people out west who want to know their past,” said Carty. “The Lovettsville Historical Society is an under-realized little treasure in the northwest corner of Loudoun County,” said Carty. “The mission statement is to expand and protect the history of Lovettsville and the surrounding German settlement and we are always looking for more ways to do that,” she said. 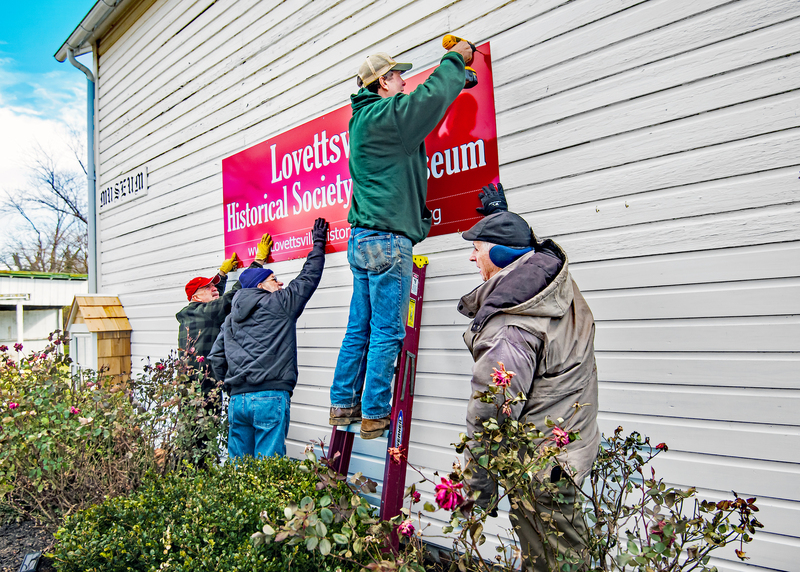 Zapf explained that people get bored with the same museum displays so the Lovettsville Historical Society decided to change the displays during the renovation and tell more of the story of Lovettsville. New families buying old houses want to know its history and there are others who are in new housing are interested in what was there before their housing development was built, he said. 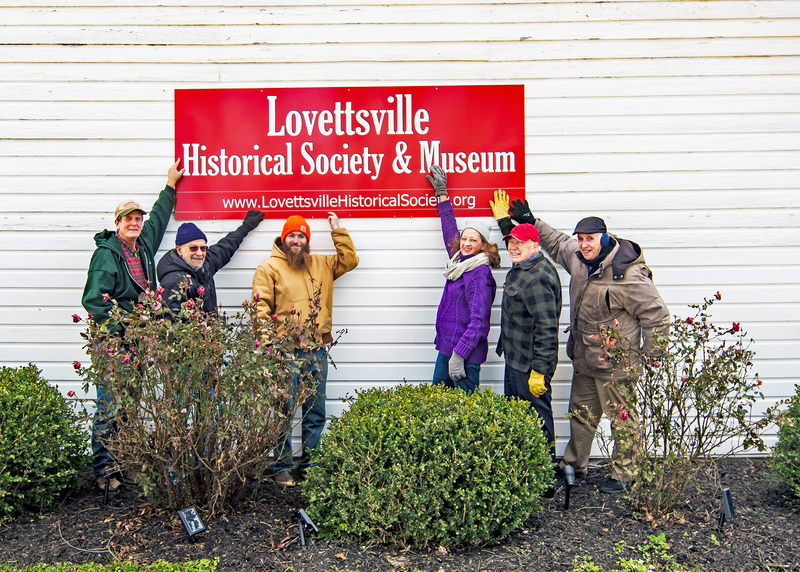 The Lovettsville Historical Society will hold its Annual Membership Meeting at 2:00 pm on Sunday, December 9 at the Lovettsville Museum. The meeting is open to all members and prospective members, and will feature an exhibition of the Museum’s new design and displays. The Lovettsville Museum is located in the historic “Potterfield Meat Store” (circa 1890) building next to the the parking lot in front of the Town Hall at 4 East Pennsylvania Avenue in Lovettsville. The museum is open from 1:00-4:00 on Saturdays, year round. For more information, visit LovettsvilleHistoricalSociety.org.